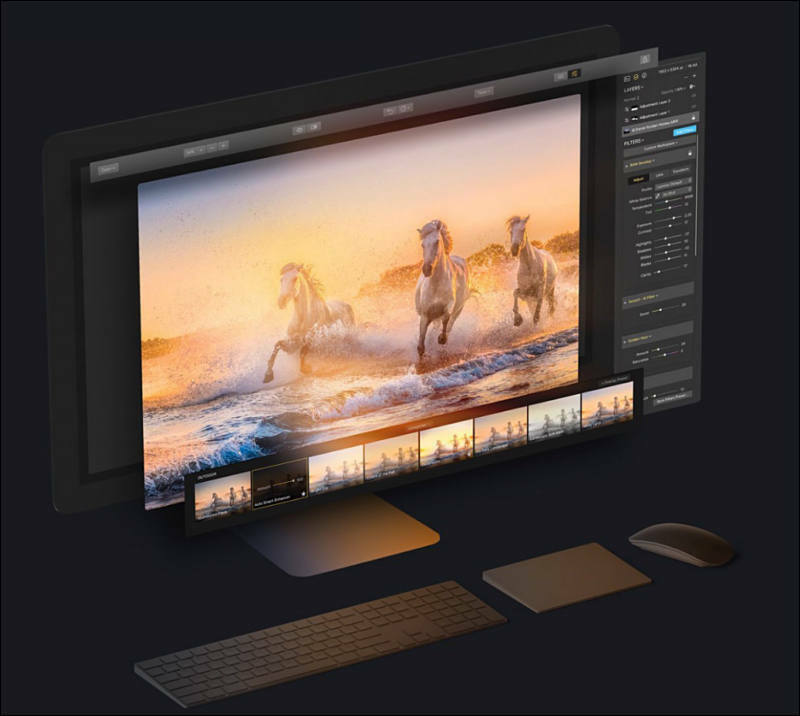 Macphun, the California-based software developer today announced Luminar 2018. New users will be able to purchase Luminar 2018 for $59, and current users of Luminar may upgrade at a special price of $39. Preorders start November 1 at www.macphun.com/luminar. Luminar offers a new RAW Engine that can handle high-quality images faster. Plus, it's easy to solve image problems caused by camera lenses with Lens Correction features that resolve vignette, distortion, and color aberrations. If the photo has unwanted perspective problems, a new Transform tool can quickly solve them. Fixed issue with preset opacity slider on an image layer. Fixed mask drawing on an image layer. Improved workflow with other applications. We’ve addressed several small bugs reported when working with * Adobe Photoshop, Adobe Photoshop Elements, Adobe Lightroom, and Photos for Mac. WHO: Skylum Software, creators of multi-award-winning Luminar 2018 imaging software, has added new and improved features with Luminar 2018 Jupiter. WHAT: Luminar 2018 Jupiter now provides processing speeds up to 5X faster with Windows and 12X faster with Mac. WHY: Through the efforts of its internal product development team, Skylum Software has developed one of the fastest, easiest, and most affordable universal image processing software in the world. A one time, low-cost purchase with no annual subscription. "Our loyal community of users continues to offer ideas for additional features that would benefit their respective workflows, and we continued to listen, learn, and improve," said Alex Tsepko, CEO of Skylum. "Our goal is to produce a fast, easy, and feature-rich imaging software that can offer both single-click solutions as well as custom functions for those want absolute control. IMPROVED Raw Develop. The Raw Develop filter has improved handling of the Lens and Transform effects. Effects are not shown on the left side (Before) when using the Compare option. The effects are also not blended with original when using the Filters Amount slider. IMPROVED Sharpening. The Sharpening filter is more responsive and accurate. As you adjust the controls all changes are visible in high resolution with real-time feedback. IMPROVED Batch Processing. You can now export to several file formats including new options for PDF and JPEG-2000. IMPROVED LUT Mapping. You can now easily scroll through your LUTs in the LUT Mapping filter. Just hover your mouse over a LUT and it updates in real-time. IMPROVED Language Support. Luminar offers eight Improved localizations: Chinese, Chinese Simplified, French, German, Japanese, Portuguese, Portuguese (Brazil), and Spanish. IMPROVED Image History. It is now possible to use the "Save History" option when saving a file with the "Windows Compatible" option. Additionally, White Balance presets are now displayed in an image's history with the preset name when using the RAW Develop and Develop filters. NEW Plugin Support. The following third-party plugins can now be used via the Plugins menu: Imagenomic Noiseware 5, Imagenomic Portraiture 3, Imagenomic Realgrain 2, and DxO FilmPack 5. IMPROVED Filter Controls. To save you time, all filter checkboxes can be enabled or disabled by clicking on the control name or the checkbox. Additionally, be sure to try scrubbable number sliders. Just mouse over the value for a filter and then click and drag left or right to move the slider. IMPROVED JPEG Controls. Take precise control over JPEG and JPEG-2000 compression. You can see a numeric value for the Quality slider. You can also click on the number and enter a precise value. NEW Faster opening of RAW-files. You can now open raw files much faster thanks to improvements in our RAW engine. NEW White Balance Tool. A new White Balance functionality and eyedropper tool have been added to the Raw Develop, Develop, and Color Temperature filters. NEW Image History. It is now possible to use the "Save History" option when saving a file. Additionally, White Balance presets are now displayed in an image's history with the preset name when using the RAW Develop, Develop and Color Temperature filters. NEW Layer Renaming. For all new layers, you add to a document (except for the original image) you can choose to assign a custom name. Just double-click on a layer's name to edit it. This is a great way to organize adjustment and image overlay layers in your project. IMPROVED Filter Performance. You can now add or subtract filters more quickly to an image. IMPROVED Blending Modes. When you choose a blending mode for an Adjustment or Image Layer, the experience is even easier. Just hover your mouse over a blending mode and it updates in real-time. This is an easy way to simply mouse-over the list to find the perfect blending mode. IMPROVED LUT Mapping. You can now easily scroll through your LUTs in the LUT Mapping filter. IMPROVED Language Support. Luminar offers seven improved localizations: Chinese, Chinese Simplified, French, German, Japanese, Portuguese (Brazil), and Spanish. NEW Canvas Color. You can now set the Canvas background color to White. Choose View > Background > White to set the working Canvas to White or choose from other shades of gray or black. NEW DNG Camera Profiles (DCP). Are you looking for truly professional control over your raw files? Then give DNG Camera Profiles a try. Luminar recognizes the industry standard DCP files that you may already have on your computer (or have bought from third parties). IMPROVED Batch Processing. Windows users gain the useful Batch Processing improvements. These include the ability to "Replace or Skip Files" when saving the file with the same name when Batch Processing. Additional options include the ability to create JPEG and TIFF files as well as improved reliability when renaming and numbering files on export. Bellevue, WA – October 11, 2018 — Skylum Software announced it will add AI Sky Enhancer, a new and highly advanced AI filter to Luminar on November 1, 2018. This new feature will be in advance of Luminar Libraries, which is scheduled for release in December. AI Sky Enhancer is a new filter developed in the company’s AI Lab to add depth, definition, and detail to the sky without creating artifacts or affecting other aspects of the image, including permeable objects like bridges and trees where sky is intertwined. AI Sky Enhancer joins Accent AI and Foliage Enhancer currently available in Luminar 2018, to create a fast and extremely powerful trilogy of single slider solutions for automatic image correction. Skylum’s AI enhancement filters were created for photographers who neither have the time nor the desire to spend hours correcting photos and would rather focus on creating photos. Skylum’s AI Lab consists of top computer scientists and professional photographers creating checks-and-balances between science, technology, and real-world human experience. Last month Skylum made the unprecedented decision to include every new feature of Luminar – big or small – at no additional cost to customers through 2019. This includes Libraries, the much-anticipated addition to Luminar. Libraries will allow photographers to organize, browse, and edit images on-the-fly. Luminar Libraries will be the first of many exciting updates to Luminar over the coming months. 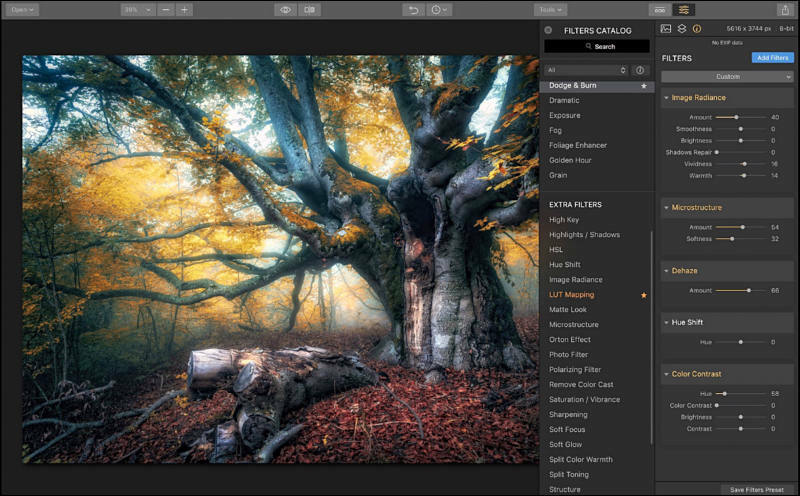 Skylum also incorporates AI technology into other software titles including Aurora HDR, the industry standard for HDR software and reigning Mac “App of the Year.” Its new Quantum HDR Engine uses AI technology to analyze and extrapolate the best details from each bracketed image used in the HDR process to create a single file that renders more details in the shadows, highlights and midrange than ever possible before. The Quantum HDR image can also work on single raw photos and makes Aurora HDR a great tool as a first step in photo editing. Complete AI automation is most evident in Skylum’s new Photolemur 3, a consumer-focused image correction software that automatically analyzes and fixes issues with exposure, noise, contrast, color, and several skin and portrait correction functions with incredible accuracy. Skylum Softwaretoday released the new free update to its award-winning photo editor Luminar and presented the AI Sky Enhancer filter. Developed in the company's AI Lab, the AI Sky Enhancer adds depth, definition, and detail to the sky almost instantly, with only a swipe of a slider. AI Sky Enhancer is a revolutionary new tool for automatically enhancing skies and making them beautiful without the need for creating masks and layers. This will save photographers an enormous amount of time in post processing while expanding the benefit of achieving dramatic skies to photographers who may lack the skill set needed to create these results. Hundreds of thousands of photos incorporating varying degrees of tonal skies were used to "train" a deep neural network that powers the AI Sky Enhancer filter and allow Luminar to analyze the image and detect (and adjust) only the sky. The result is complete, automated control of the sky, from sunsets, blue skies, partly sunny, storm clouds, or virtually any other sky scene imaginable. The new AI-powered filter comes ahead of Luminar 3 with Libraries, which will begin its roll-out to Luminar owners on December 18. Skylum made the unprecedented decision to include every new feature of Luminar -- big or small -- at no additional cost to customers through 2019. 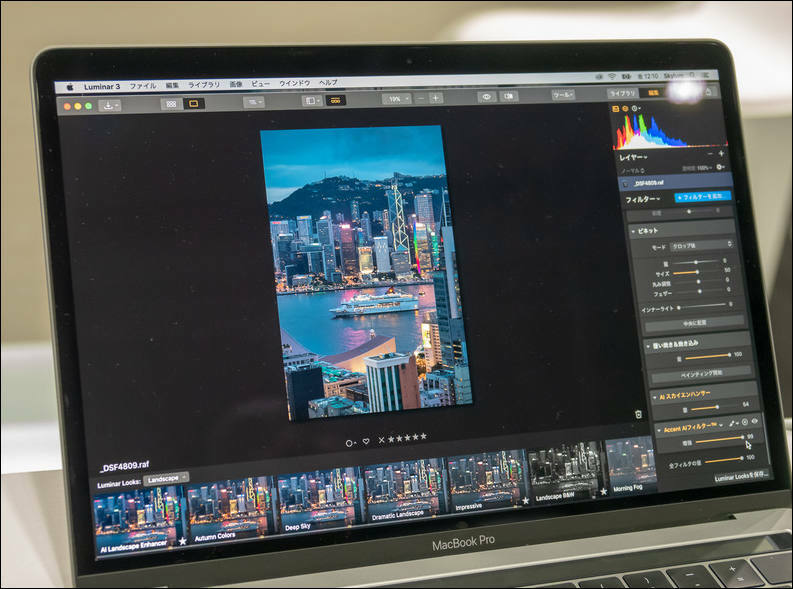 This includes Luminar 3 with Libraries, which will allow photographers to organize, browse, and edit images on-the-fly. And, Luminar customers will never pay an annual subscription fee. New and current users of Luminar will also receive a value-add promotional package including a three-month Pro Membership to ViewBug ($42), two-month Pro Membership to KelbyOne ($40); a choice of any e-book from Rocky Nook ($40), Awesome Landscapes Tutorial from Daniel Kordan ($80), and a $20 gift card toward the purchase of any Manfrotto / Gitzo product valued at $125 or more. Luminar is available to new customers for $59. Current users of other Skylum software titles including Aurora HDR, Photolemur, and Skylum legacy products can purchase Luminar for a special price of $49. AI Sky Enhancer joins Accent AI and Foliage Enhancer currently available in Luminar, to create a fast and extremely powerful trilogy of single slider solutions for automatic image correction.